A properly functioning muffler and exhaust system keeps your car quiet and also reduces air pollution. We are the experts in Littleton Exhaust Repair. 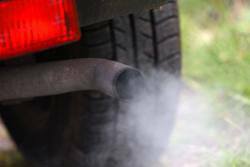 Your vehicle's exhaust emission system begins at the front of your car, behind your engine. As the gases pass through the exhaust system, they're analyzed by oxygen sensors, then refined by the catalytic converter and finally, muffled by the muffler, making your car run smoother, cleaner and quieter. Exhaust manifolds connect to the cylinder heads, where they collect exhaust gases. It's a complex system, and when there's a problem, it can be noisy. Our expert mechanics are pros when it comes to diagnosing the exhaust issues and getting your vehicle back in working condition. We offer a full range of exhaust service options, from high performance mufflers and exhaust systems to value-oriented replacement mufflers and systems. Our Littleton exhaust repair service is top notch. In addition, we guarantee you quality, name brand parts installed by a trained, tested and top-of-the-line technician at a great value.